When December 5, 2013, the day of the death of Nelson Mandela, a terrorist attack left 56 dead on the ground in a hospital in the capital, Murad Subay decided that the minute of silence decided by the government was not enough. He picked up the names and all the photos that could. A few months later, with a group of young artists Yemenis, drew on the walls of the hospital hit the faces and names of the victims, almost all medical and health personnel. That’s who is the artist who Science for Peace has decided to award this year with the Art for Peace Award, an important recognition given to artists who have distinguished themselves for their commitment to peace. Subay Murad was born in 1987 , so young and yet is the father of the art of graffiti in Yemen. Began to talk the walls in March 2012 through the campaign ” Colour your’s Wall Street , “at which he encouraged the Yemeni citizens, especially the young, to color the walls damaged by the civil war broke out in Yemen in 2011. 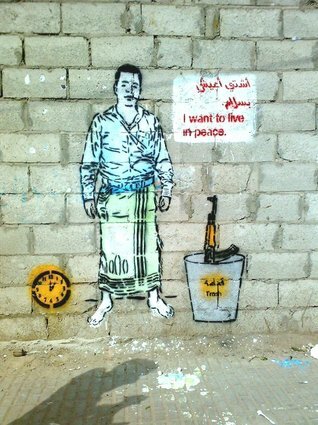 This year Subay launched its third campaign entitled ” 12 Hours “, to illustrate the twelve major policy challenges facing the horizon Yemeni through graffiti art. The reasons for the assignment of the Art for Peace Award are all here: Murad has managed to create an artistic movement and not a pacifist anti-political, indeed, that aims to raise awareness towards politics. It involved a high number of people from civil society in a country plagued by war for more than 50 years. Posted in 12 ساعة, All Posts, NewsTagged art for peace award 2014, Huffington post, murad subayBookmark the permalink. صور من حفل تسلمي جائزة “الفن من أجل السلام 2014” في مدينة ميلانو، إيطاليا. During my speech in the receiving the award of Art for Peace 2014, Milan, Italy.